Families with children 18 and under are tasked with completing at least 10 of 12 challenges from at least four different local nature sites by Aug. 26. The participants are asked to chronicle the challenges through a journal. At the end of the summer, prizes are awarded. 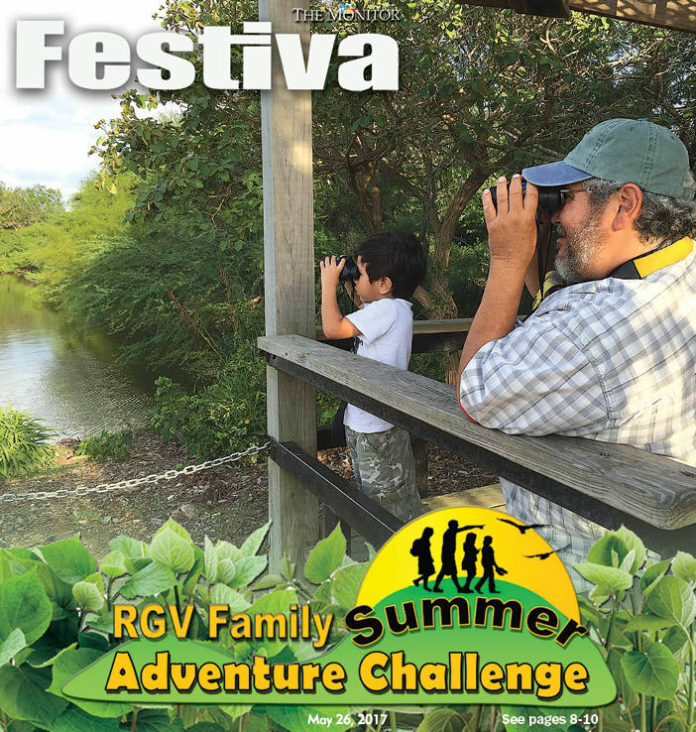 While visiting the Laguna Atascosa National Refuge in Cameron County last year, Stella Mull and her family were made aware of the Rio Grande Valley Adventure Summer Challenge. The Mull family of San Benito speaks highly of 21 nature sites in deep South Texas. The sites are all a part of a summer-long program that began in 2014 as a way to encourage families to spend time outdoors. Families with children 18 and under are tasked with completing at least 10 of 12 challenges from at least four different local nature sites by Aug. 26. The participants are asked to chronicle the challenges through a journal. At the end of the summer, prizes are awarded. The free nature challenges are a way to get her grandchildren out of the house during the summer, Mull said. Along with her husband Raleigh Mull and her grandchildren Ryan Hite, Dylan Hite, McKenzie Mull and M.J. Mull, they make up a team they call the Ocelots (You get to pick your own team name). That was the concept when the Edinburg Scenic Wetlands & World Birding Center began offering the challenges three summers ago. In 2014, only five families participated and only the center offered the challenges. The following year, the center reached out to other nature sites in the Valley to open their doors to the challenges. Twenty families completed the challenges in 2015. Last year, the number of participants ballooned to 500 from 120 families. The challenges are modest. One asks participants to identify and draw four birds. Another requires you to take part in a water-based activity such as swimming, kayaking, fishing, etc. Marisa Oliva, who manages the Edinburg Scenic Wetlands & World Birding Center, said many locals don’t realize they have options for outdoor activities in the Rio Grande Valley. The Mulls was one of the families that discovered the program last year and embraced nature. Kickoff events for the program will be held Saturday at eight of the nature sites. For more information or to register for the challenges, call (956) 381-9992 or visit naturechallenge.tamu.edu or edinburgWBC.org. You can download the journal (one per family) online or have it mailed to you. Peter Rasmussen (Team Peter Parker) will take part in the Rio Grande Valley Summer Adventure Challenge. Follow along as he attempts to complete the 12 challenges. Rasmussen will provide updates on his progress in The Monitor, through a video blog on the newspaper’s YouTube channel, monitornews and through the newspapers various social media accounts. 3333 Butterfly Park Road, Mission. 4101 W. U.S. Highway 83, McAllen. Open 7 a.m. to 6 p.m. Monday to Saturday and until 8 p.m. Thursdays. Visitor Center open 8 a.m. to 5 p.m. Monday to Saturday 8 a.m. to 5 p.m.
Open 8 a.m. to 5 p.m. daily and until 7 p.m. on weekends.